Currently, retail food establishment license fees are established in statute. The bill authorizes a county or district board (local board) of health to establish fees that are lower than the fees set in statute as long as the local board is in compliance with current law regarding food safety. The bill removes language prohibiting a county government from supplanting funds from increased revenues based on increased license fees for other county programs. The bill requires a local board that chooses to establish fees lower than those in statute to continue to remit $43 from each fee to the state treasurer. The services are covered services under the person's policy; and The carrier provides payment for the service under the person's policy in an amount that is reasonable and not nominal or de minimis. The bill authorizes a dentist to charge a covered person for noncovered items or services in any amount determined by the dentist and agreed to by the patient if the amount is equal to, or less than, the usual and customary amount that the dentist charges individuals who are not enrolled for such items and services. The district attorney of each judicial district, with the approval of the boards of county commissioners comprising the district, currently fixes the salaries of any assistant district attorney, chief deputy district attorney, and deputy district attorney in the district. There are currently no minimum salary amounts in law for these positions. The bill establishes minimum salary amounts for these positions based upon the salary ranges of certain employees of the state public defender's office. Assistant district attorney - 80%; Chief deputy district attorney - 50%; Deputy district attorney - 20%. The bill allows the boards of county commissioners of the counties within a judicial district, in consultation with the district attorney, to make a one-time irrevocable election to require an assistant district attorney to become a member of the public employees' retirement association's defined benefit plan. In such case, the state would pay 80% and the counties would pay 20% of the employer contribution for an assistant district attorney. The medical marijuana system is a vertically integrated regulatory scheme, meaning a medical marijuana center must grow the marijuana that it sells. There is one exception to the vertically integrated market: A medical marijuana center can sell to or buy from other medical marijuana licensees up to 30% of its inventory. The bill changes the 30% limit to 50%. 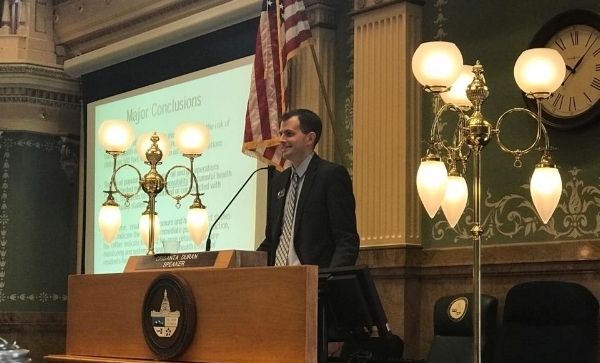 The bill states that a medical marijuana center may transfer medical marijuana to another medical marijuana licensee if the licensees have a common owner without the medical marijuana counting towards the 50% limit. Current law caps the compensation that a special district board member may receive at $1,600 per year and $100 per meeting attended. The bill increases this amount to $2,400 peryear and specifies that special meetings include study sessions in specified circumstances. Authorizes a limited cooperative association to operate as a public benefit corporation; Deletes the requirement that a public benefit corporation's entity name explicitly refer to its status as a public benefit corporation, and instead requires that before issuing shares of stock or disposing of treasury shares that are not required to be federally registered, the public benefit corporation must provide notice to the person to whom the stock is issued or who acquires the treasury shares that it is a public benefit corporation ( section 1 of the bill); Subjects transactions to opt out of status as a public benefit corporation to the requirement to get shareholder approval ( section 2 ); Clarifies the requirements applicable to the filing of the annual public benefit report ( section 4 ); and Clarifies that the existence of a provision of the public benefit corporation law does not of itself create an implication that a contrary or different rule of law is or would be applicable to an entity that is not a public benefit corporation ( section 5 ). The bill allows a special district having a 5-member board to increase the number of board members to 7 by the adoption of a resolution by the board and the approval of the resolution by the board of county commissioners or the governing body of the municipality that approved the service plan of the special district. If an increase is made, a board cannot be reduced back to 5 members. The bill also specifies the length of the initial term of each new special district board member and sets forth the election requirements. May have their driver's license canceled; May not receive a new driver's license; and May not renew a current driver's license. The bill repeals these penalties and provides courts with the option of withholding a driver's state income tax refund in order to satisfy the outstanding judgment. Currently, a person may qualify as an eligible elector in certain district elections if the person is an owner of taxable real (or, for some districts, personal) property situated within the boundaries of the district or the area to be included in the district. Further, a person is considered to be an owner for election purposes if the person is obligated to pay taxes under a contract to purchase such taxable property. Local governments, as defined in the 'Local Government Election Code' (i.e., any district, business improvement district, special district created pursuant to title 32 of the Colorado Revised Statutes, authority, or political subdivision of the state, authorized by law to conduct an election; but does not include a county, school district, regional transportation district, or municipality) ( section 1 of the bill); Law enforcement authorities ( section 2 ); Public improvement districts ( section 3 ); Local improvement districts ( section 4 ); Downtown development authorities ( section 5 ); Special districts formed under the 'Special District Act' ( sections 6 and 7 ); The urban drainage and flood control district ( section 8 ); Water conservancy districts ( section 9 ); and Groundwater management districts ( section 10 ). The bill sets forth the conditions under which a probation officer may arrest a defendant who has been granted a deferred judgment and sentence. The bill also makes corresponding amendments to the conditions under which a probation officer may arrest a probationer. If property taxes are levied erroneously or illegally and a taxpayer has not protested the valuation within the time permitted by law, then the taxpayer has 2 years from the start of the property tax year to file a petition for abatement or refund. The board of county commissioners is required to abate the taxes, and the taxpayer is entitled to a refund for the incorrect amount and, in some circumstances, refund interest equal to 1% per month. The bill eliminates the refund interest related to a property tax abatement. Colorado identity theft and financial fraud cash fund from $3 to $4, which increase is scheduled to repeal in 2017. The bill extends the scheduled repeal date for the increased fee, and for an associated report to the general assembly, until 2018.